The Flash has, throughout its Season 1 run, revealed a lot of mysteries to the viewer. One such mystery, however, has remained unsolved, until tonight, when the CW released a clip that reveals how all of the prisoners stuck in S.T.A.R. Labs’ high tech facilities are fed each day. As it turns out, the answer is: lots and lots of takeout. Check out the deleted scene, below. 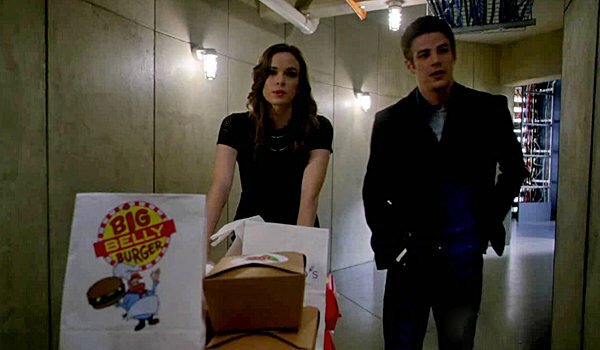 The deleted scene was originally from tonight’s episode, “Grodd Lives,” and follows a conversation between Barry Allen and Caitlin Snow regarding Wells and his betrayal to the team. Barry’s annoyed at Wells, which has been usual per late, and Caitlin’s notably upset by the news, noting that there have been a lot of bombshells dropped on her at once regarding her once-mentor. But there’s no time to dwell on the fact that Wells is a big baddie from the future who took out the Flash’s own mother, because she has prisoners to feed! The clip comes from E!, who says The Flash ended up having to cut the funny segment due to time constraints. It sounds like this is a job that is normally reserved for Wells, but in his absence Dr. Caitlin Snow has taken over the take out orders. That’s right, in order to keep the knowledge of the secretly imprisoned metahumans underwraps, S.T.A.R. Labs has been bringing their prisoners their choice of takeout, seemingly ever day. Just look at that large pile of takeout options. I wouldn't want to be the person footing that bill. It looks like The Flash team is extremely accommodating to the baddies that they take down, even giving them various options concerning where they get their takeout. Caitlin totally confirms this later in the clip when she announces some of the prisoner’s eating habits, including the fact that Deathbolt is vegan, which totally fits. On the other hand, I now know all the dietary habits of our metahuman inmates. Did you know that the Weather Wizard orders Thai food every day? And that Peekabo loves enchiladas, and Deathbolt is vegan? The question of what the prisoners eat has been rolling around the internet since Barry Allen started taking down foes as The Flash, but thankfully, we’ve finally gotten an answer regarding the food query, at least. Now, where the prisoners shower and where they exercise are the only prisoner-related mysteries I’d still like to solve. I mean, hanging out in a tiny box eating takeout everyday can’t be good for your health, right? These might have to be storylines left to future seasons. Still, The Flash has a couple more episodes left this season, and probably a few more surprises up its sleeve. The Flash airs Tuesdays at 8 p.m. ET on the CW, and the show’s season finale—which is expected to come with a “big twist”—will hit the schedule on May 19.